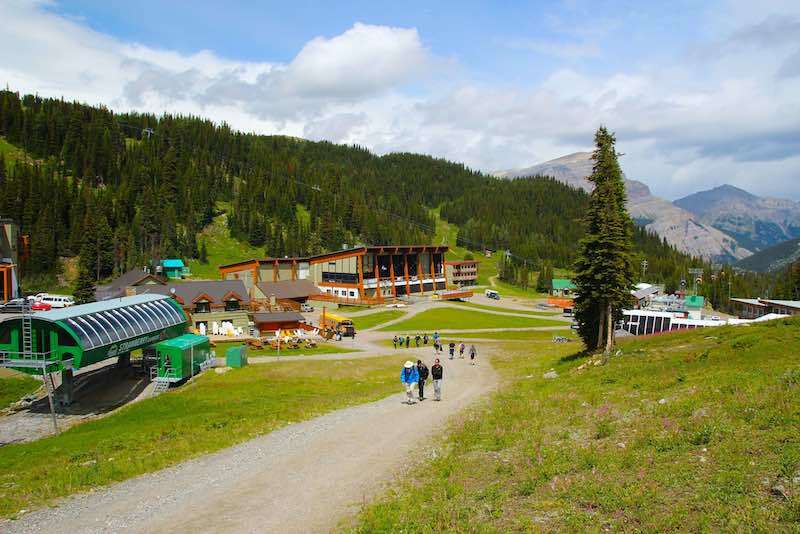 Most of the visitor’s to Sunshine Village arrive during the winter months for epic skiing and snowboarding, but an increasing number of people are discovering that the popular resort is also worth a trip in the summer. 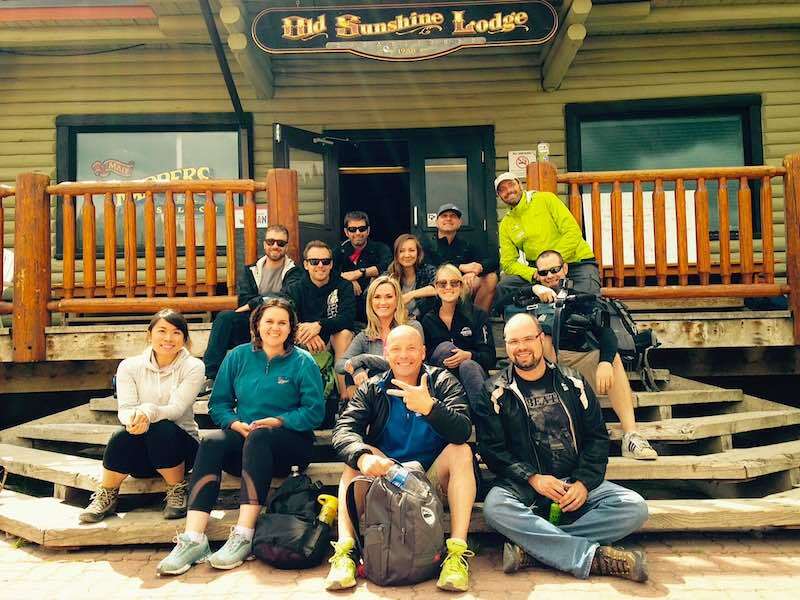 Sunshine Village was featured in a previous story (Skiing & Riding) I wrote about the unprecedented access Calgarians have to world-class downhill skiing and snowboarding, but this time I’d like to share a recent mid-summer experience I had at Canada’s highest ski hill. 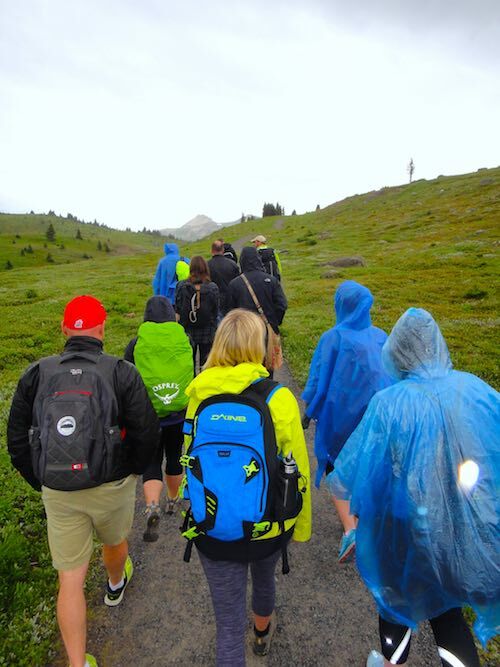 Lindsay Gallagher, the Media and Marketing Coordinator for Sunshine Village, reached out and offered me a spot on a media day guided hike she was organizing for late July. 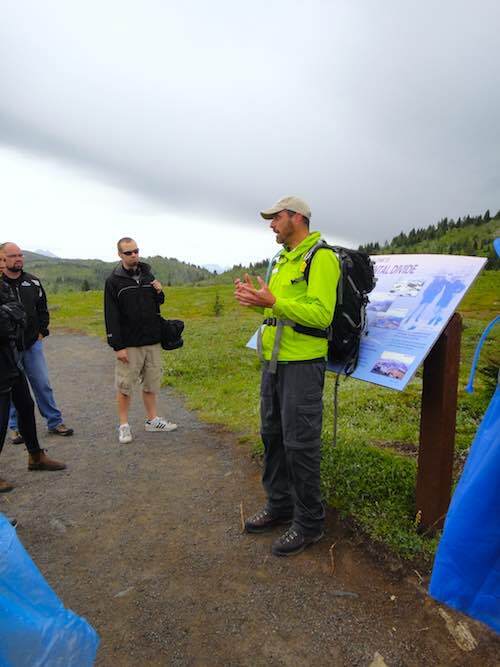 The idea behind the event was to promote Sunshine Meadows, as it’s called during the summer months, as a year-round destination for outdoor enthusiasts. 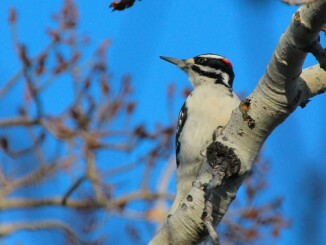 The event was well attended by local media outlets from Calgary and the various communities throughout the Bow Valley. I jumped at the opportunity as I’d never been to Sunshine Meadows in the summer, but had always wanted to do some hiking in the area. I was filled with excitement as I pulled into the parking lot the morning of the event even though the slate-grey sky was threatening rain. Sunshine sits on the Continental Divide; a line that follows the height of land and separates areas drained by rivers that flow to opposite sides of the continent. 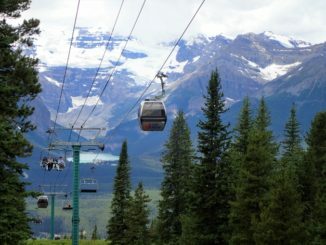 This imaginary line also separates the provinces of Alberta and British Columbia, making it possible to ski, snowboard, snowshoe, or in this case hike between two provinces on the same trail. There is evidence of human presence that dates back to the end of the last ice age, so we know the area has been used for centuries. 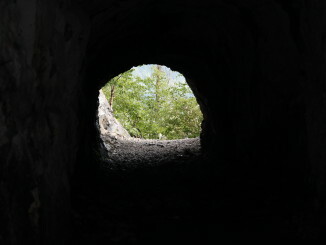 Before European contact Shuswap Pass (now known as Simpson Pass) was used as a trade route between the Shuswap and Stoney First Nations. Sir George Simpson, the same person the aforementioned Pass is named after, is credited as the first European to travel through the Sunshine area on his trek around the world. We gathered in the Creekside Lodge at the base of the mountain where we met our interpretive guide, Alex Mowat from White Mountain Adventures. Mad Trapper’s Saloon, located at the base of the Strawberry Chairlift, acts as the unofficial trailhead for many of the area’s hikes. 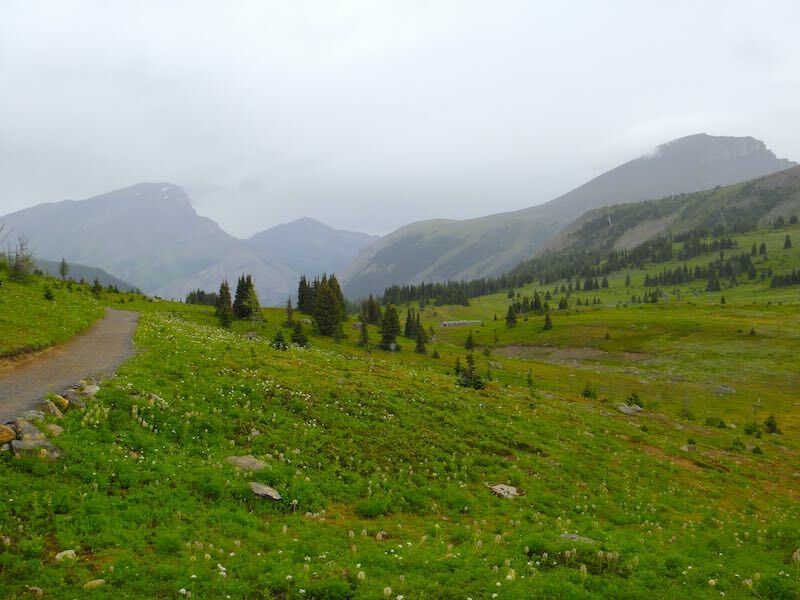 There are two ways to approach the trailhead; on foot via the access road, which will take you a couple of hours, or by the hourly shuttle bus, which is the preferred method for many. We opted for the bus and a short drive later were standing outside Trapper’s, staring up at peaks most of us had only seen covered with snow. Alex quickly gathered us around a map of the area (see above) as he outlined the plan for the day. A typical guided tour would last between four and five hours and see guests hike along Rock Isle Trail towards its namesake, Rock Isle Lake. 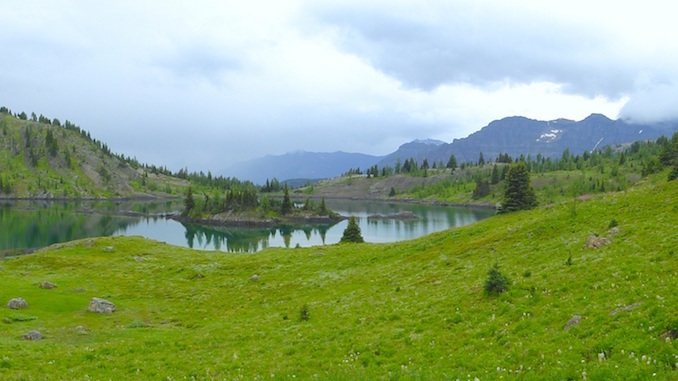 From there they would follow The Garden Path Trail around Grizzly and Larix Lakes before working their way back via Twin Cairns Meadow Park Trail. We had a lot less time so our guided adventure would see us hike past Rock Isle Lake towards Grizzly Lake to where the wildflowers were most prevalent, before reversing course and heading back to Trapper’s for lunch. As previously mentioned our hike took place in two provinces, but we were also in two separate parks. 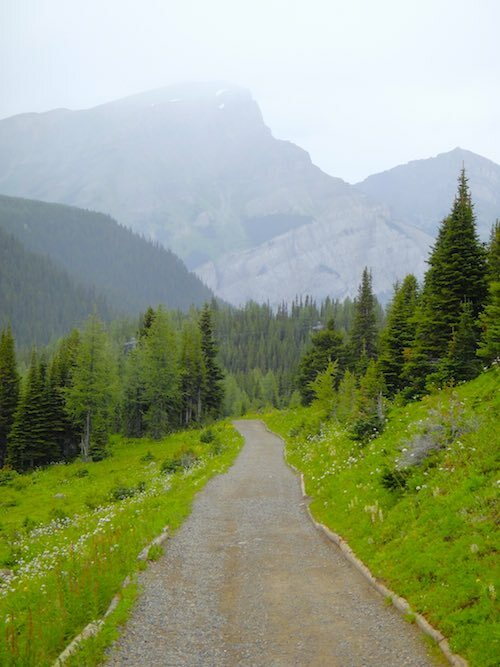 The Sunshine Village leasehold sits entirely within Banff National Park, but when you cross the Continental Divide and enter British Columbia, you are now in Mount Assiniboine Provincial Park. The park’s namesake peak, Mt. Assiniboine, also referred to as the Matterhorn of North American, can be seen from different vantage points throughout Sunshine Meadows. The interpretive portion of the day-hike was what made the whole experience truly special. Alex was a wealth of information and talked at length about geography, hydrology, glaciation, weather, history, and all of the local flora and fauna you may encounter. It was disappointing that we weren’t part of his full program because his knowledge about the area and passion for the outdoors was infectious. 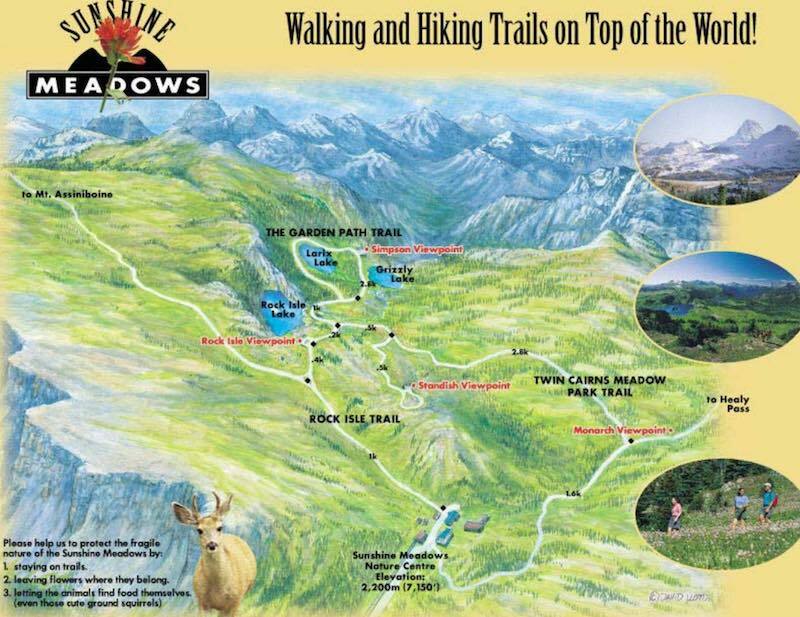 I guess it is an excellent reason to return to Sunshine Meadows and partake in the full guided hiking program. White Mountain Adventures is offering free guided programs for the rest of the summer season, so be sure to take advantage of this offer. 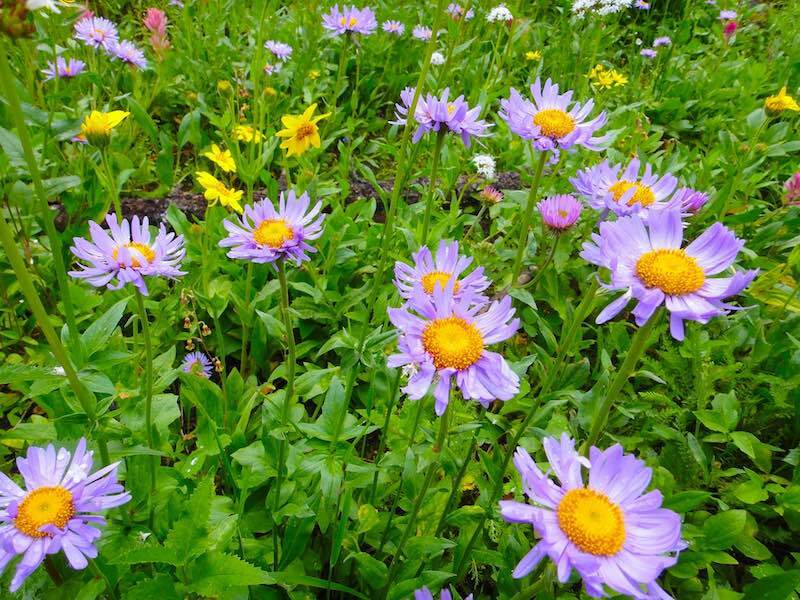 Of course one of the biggest reasons people are drawn to Sunshine Meadows is the abundance of wildflowers that can be found there. In late spring and early summer the meadows and hillsides are blazed with blooming flowers and are painted in vibrant colours. It’s truly spectacular and nothing like I’ve ever seen before! I would just like to close by thanking Lindsay Gallagher and Alex Mowat for taking the time to plan, coordinate, and execute a wonderful media day. It was a great introduction to the summer adventures that abound at Sunshine and was enjoyed by all in attendance. 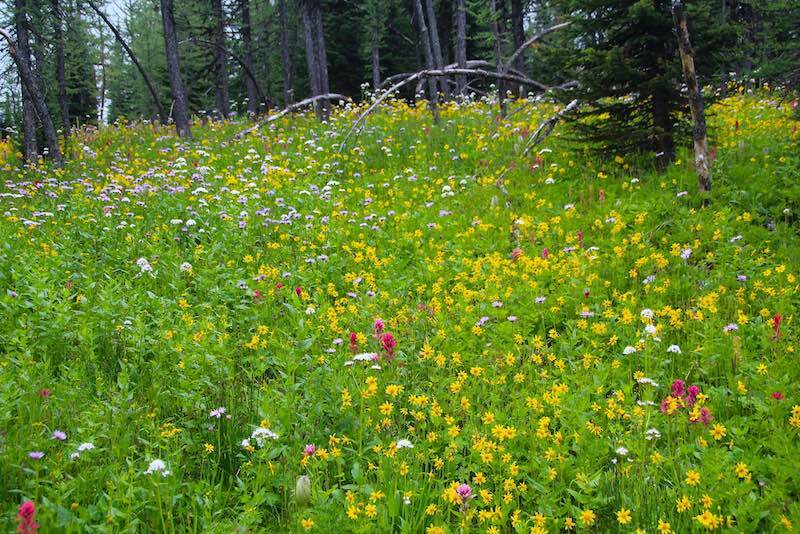 I’m already looking forward to my next day of hiking through the flowery Sunshine Meadows. Maybe I’ll search for the ever-elusive Bill Peyto Cabin that is rumoured to still be in the area after being abandoned more than 70 years ago! Update: I found Bill Peyto’s Bookrest Cabin, which you can read about in a new story titled, Searching For Wild Bill. To ensure you’re up to date with all things happening at Sunshine Village please ‘Like’ their Facebook page and follow them on Twitter, Instagram, Pinterest, and YouTube. 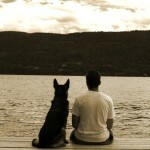 Likewise, you can find White Mountain Adventures on Facebook, Instagram, and Blogger.